The perfect Rigging kit for vacationers, fly-in trips and campers in Canada and the Boundary Waters. Bottom Bouncers with spinner live bait combinations are far and away the most productive rigging method in Canada and are preferred by top guides and Professionals. Complete instructions provide step-by-step procedures and tips for this productive technique for both locating and catching Walleyes, Pike, Smallmouth and Trout. The All Canada Rigging Kit contains a variety of Bottom bouncer weights and live bait spinner rigs and is ideal for Spring, Summer and Fall fishing. 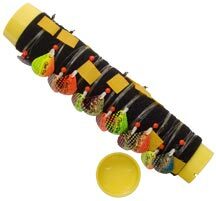 The 31-piece kit comes with a 12 capacity Tackle Tamer rig holder and complete instructions.